1 of 3 Melt 2 tbsp of the butter in a large skillet over medium heat. Add onion, celery and thyme; cook, stirring, until vegetables are softened, about 4 minutes. Add flour and cook, stirring constantly, until flour is golden, about 4 minutes. Add milk in a slow stream, whisking constantly. Cook until thickened and reduced to 1 1/2 cups, about 4 minutes. Remove pan from heat; whisk in cheeses and nutmeg. 2 of 3 Meanwhile, bring a large pot of salted water to a boil. Stir in pasta; cook until al dente, about 7 minutes. Drain pasta and return to pot. Gently stir together pasta, cheese mixture and salt and pepper to taste. Spoon into eight 5 oz to 8 oz ovenproof dishes. 3 of 3 Heat oven to 350 degrees . Melt remaining 2 tbsp butter in a nonstick skillet over medium heat. Add bread crumbs and cook, stirring, until golden, about 3 minutes. Transfer to a bowl. 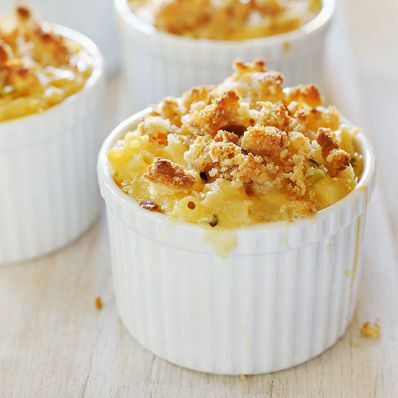 Sprinkle tops of macaroni and cheese with crumbs. Bake on a cookie sheet at 350 degrees on the middle rack until hot and crumbs are golden brown, about 20 minutes. Per Serving: 432 mg sodium, 15 g pro., 2 g fiber, 42 g carb., 11 g sat. fat, 53 mg chol., 18 g Fat, total, 390 kcal cal.